PI Ceramic also manufactures piezoelectric spheres and hemispheres in miniature format. 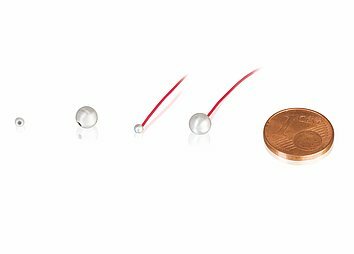 The spheres are suitable for ultrasonic applications that require 360° sensing and are used for example, in medical technology. Piezoelectric hemispheres and hollow spheres are available in new sizes. The outer diameters are between 2 and 100 mm. Wall thicknesses of 0.2 mm are possible with outer diameters of up to 10 mm. Other sizes are available on customer request. Thanks to their design, the components are generally suitable for applications, which function as 360° sound transducers with a high bandwidth. Their compact design allows them to be integrated into the smallest systems and can, for example, be used for sensor applications in medical technology. The components are manufactured according to the application range, from ferroelectric soft or hard piezo materials. This enables optimum setting with respect to the coupling factor and acoustic impedance. The spheres can be made with a hole or groove for easy mechanical integration.